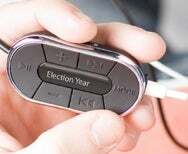 Griffin Technology announced an inline controller/FM radio for iPods and the iPhone yesterday. I know what you’re thinking: what’s the big deal about yet another remote for the iPod? Well, this one features an OLED screen that displays what you’re listening to so you can pocket your iPod and still stay in the know. So there. The Navigate, which is available now, also features an FM tuner, so you no longer have to gnash your teeth about missing all your FM favorites (though fans of AM talk radio are still out of luck). You can preset 4 stations as favorites, though you can scan the stations for those obscure stations. But wait, there’s more! Coming to the App Store in March is a companion app for the Navigate (only when you use it with an iPhone or iPod Touch, of course) called iFM. iFM extends the functionality of the Navigate by showing you a list of available radio stations based on your current location, as well as allowing you to ‘bookmark’ songs you hear on the radio for later purchase at the iTunes Store. Navigate costs $59.99 and is available now, and iFM will be a free download being in March ‘09.